The bar was nestled on the corner of a quaint cobbled street in southwest Fuerteventura, the second largest and oldest of Spain’s Canary Islands. After a tiring two weeks hopping one island to the other, the bar seemed the perfect place to refuel for our final day on the archipelago. My four friends and I found a corner booth and ordered a round of cervesas. The conversation quickly turned to the islands, which was the most beautiful, which was the one that had etched itself most into our memories. My favorite had been La Palma, the first on our visit. Like all the others, La Palma had risen from the Atlantic Ocean’s seabed following violent volcanic eruptions over the course of millions of years. But of the seven islands in the chain, La Palma was the youngest and, consequently, the most lush. Banana plantations hugged the gentle slopes that creep into the sea. Tufts of green, well-watered flora and fauna flank the mountainsides. I was recounting my impressions of La Palma when a gruff voice from the bar interrupted. We asked him to join us. His name was Juan. He was middle-aged, the skin of his face was sun-beaten, yet his deep brown eyes and surprisingly white teeth gave him a certain youth. 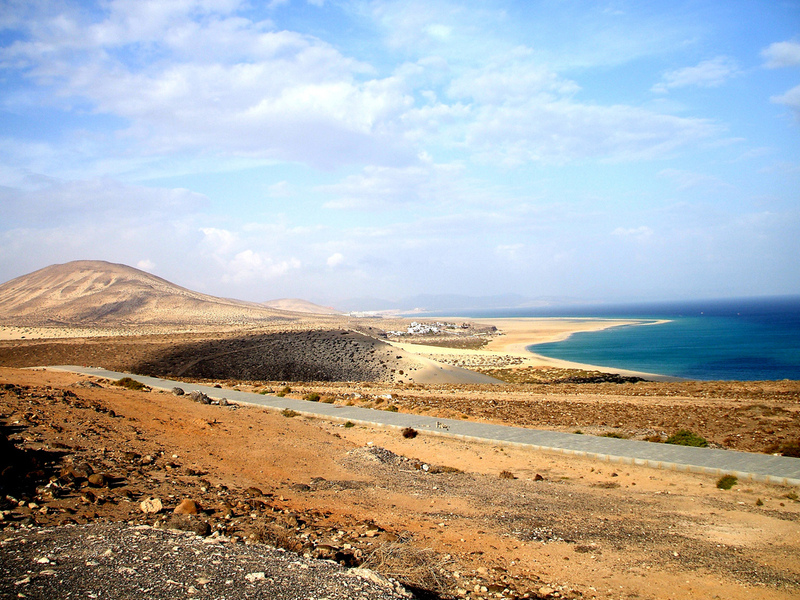 Juan’s family were goat herders, part of an agricultural industry that had been the island’s lifeblood until word of Fuerteventura’s white sands and turquoise waters spread in the 1960s and tourism took over. Shepherding in the Canaries, to hear Juan describe it, was akin to a Cirque du Soleil performance. He spoke of shepherds flying through the air like acrobats. Using giant wooden, steel-tipped poles they leapt up harsh rocky outcrops, sprang over gullies, and whisked down steep crumbling embankments with ballerina-like grace, all in an attempt to keep up with their flocks. 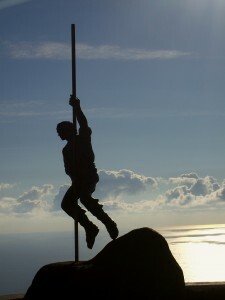 The practice, called the shepherd’s leap or salto del pastor, was not only a method of herding used by shepherds across the Canary Islands, it had also become a popular folk sport, with athletes flocking to take the top title in the annual cross-island competitions held every year in late November. Before we knew it, he was inviting us to join him in the fields the following morning. A group of five shepherds were rounding up a flock of wild goats that had spent the last few months foraging freely on the sparse shrubs that litter the countryside. We accepted the offer. We hadn’t made many plans. I wrote down the address of our hotel and floated it to Juan, who said he would send his little sister to fetch us at 6:30 a.m. “Your sister?” I wondered. “She no mind,” Juan said, as if reading my mind. “Buenos dias,” Belinda chirped the next morning. Her smooth olive skin and petite frame sat in contrast to her brother, but she had his brown eyes, his deep chortle, and the same animated way of talking. Within minutes she had bundled us into her battered green Land Rover. The bustling strip of bars and hotels gave way to rolling white sand dunes, then harsh shards of giant stone stabbing at the sky, then the smooth rise of red and yellow mountains crowned with halos of wispy clouds, and finally the sharp fall and rise of steep ravines and sweeping valleys. Loquaciousness clearly ran in the family. Belinda pulled a Juan for the next hour. 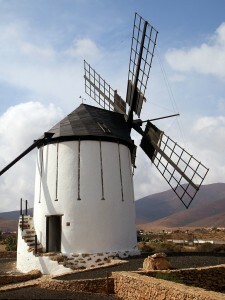 She pointed out windmills, or molinos, used to produce flour. She pointed out farms of aloe vera. “It keeps us islanders looking young,” she said, as we drove past rows of the stumpy, spiky plants. She threw back her head in laughter, sending her mass of waist-length brown curls into a frenzy. The 4×4 screeched to a halt in a patch of barren, uninhabited land. A half hour came and went. Then out of the silence there sounded a faint jingle of bells. “They’re here,” Belinda cried out, jolting me from a failed attempt at snoozing. The bells were coupled with bleating and the appearance, on the horizon, of plumes of rusty dust. Over the brow of the hill appeared one goat, then two, then three, then too many to count. The goats formed a brown and white river twisting towards us, their nimble feet dancing noisily on the blanket of scree. The occasional shout of a shepherd steering the flock echoed across the rugged terrain. “You made it,” Juan said, lifting his straw hat to wipe his glistening brow. He motioned for us to follow him and introduced us to the leader of the pack, a man named Manuel whose weathered face, weathered by the same wind and sun that had shaped Fuerteventura, made him look much older than his 50 years. Manuel explained the situation. The shepherds were trying to get a flock of Majorero goats, a sturdy breed adapted to cope with the island’s harsh weather conditions and arid land, farther south to graze on the wild grasses and aromatic herbs that give the island’s succulent goat meat and thick, high-fat milk its distinctly rich and tangy flavour. We were to accompany them for the next seven kilometres, at which point we would break for lunch before the shepherds continued on their journey. “Try to keep up,” Juan called out as we set out. Keeping up proved daunting. The shepherds, most of them twice my age, moved briskly over the parched island. The goats were even quicker. They disappeared in the dips in the land up ahead only to reappear as dots racing up the side of the mountain. As the sun pounded on me in Fuerteventura, not even close to reaching its climax, I yearned to be hiking through the forest in the heart of La Palma, in search of the minas galerias, the water tunnels that stretch from the thundering waterfalls in the mountains to cities, villages, and farms, providing islanders with their sole source of water. I recalled how standing on La Palma’s highest summit, overlooking the sea of clouds that lapped below, I had pulled my jumper around me and felt pangs of icy air pinch into my skin. Even amid the cacti-riddled lands of Tenerife, the largest of the Canaries, cool could be found in the shadows of towering pine forests or on top of Mount Teide’s 3,718 metre summit that stares straight into the cavernous mouth of the volcano that gave birth to the island. But not on Fuerteventura. Fuerteventura is all rugged rock beds, barren deserts of jutting stone, rough seas of swirling oranges and yellows and reds, interrupted, only intermittently, by little miracles of shrub. Shelter is as sparse as the sun is prolific. Lakes that once glistened with water are now nothing more than dusty plateau. But none of the other islands had produced a character as unforgettable as Juan. I wondered about the connection between landscape and people, if it might be the case that sheerer terrain made for more memorable personalities. There was nowhere to hide in a place like this. You were always on display, always opened up to the elements. Footsteps fell faster along the scrubland. Words poured from mouths with more fluidity. At least that seemed to be the case for these tenacious shepherds. As for me, my energy levels were reaching an all time low. But Belinda, as if on cue, pointed to a speck moving way in the distance and said the words I’d been waiting so desperately to hear: “Our stop.” At the bottom of the hill was the herd of about 50 already-penned goats, a van full of bottles of sweating, ice-cold beers, and a roaring barbecue roasting goat kebabs. Marissa Carruthers is a freelance journalist and travel writer. After spending nine years working at newspapers in the UK, she is now based in Cambodia. Follow Marissa on Twitter @LittleMsChief.